Only Canon, Nikon and Canon? When reading camera ads and articles these days one gets the impression that there are only three brands: Canon, Nikon and Canon. Well, there are more, but they seem to drown in the intense marketing of the biggest ones. And certainly there have been many more during the life of the PP SLR. Forests and meadows of colourful flowers in terms of innovative contributions to the camera history. Presented here are the many brands that are not making PP SLRs anymore. Some are totally out of business, some are still there but not making cameras, some make cameras but not PP SLRs. Almost all cameras shown are of my collection. The few mentioned but not shown are not. Yet. The lost brands are presented decade by decade. All brands are given a page of their own. Years of production are from the first to the last PP SLR. The company usually is older and may have lived longer, but producing other cameras or other products. Not included in this list are all the housebrands that have existed since the early days. 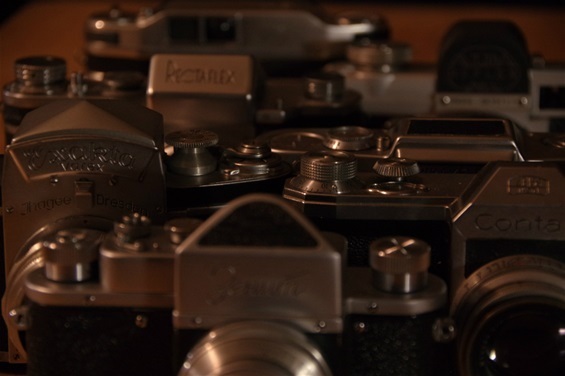 Most of them were produced by Cosina, and can be found under "The Cosina List". You have done a great work with your site. Can I suggest to include two Chinese brands? Seagull and Pearl River, I think they are worthy of mention. Thanks! Seagull has been on my list, while Pearl River is new to me. I'll dive into this! Regards.